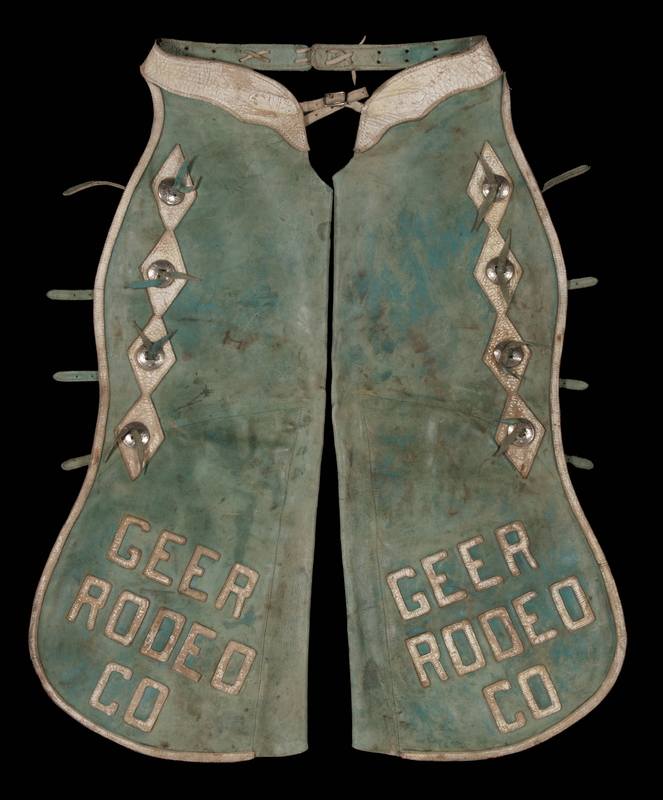 These beautiful leather chaps, with great color, wear, and patina, were made for the Geer Rodeo Company of Montana. 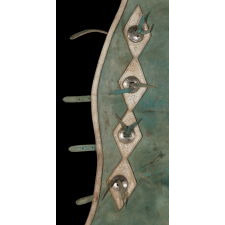 Nickel-plated conchos, with pressed decoration in a Southwestern, Native American style, are tied with leather to series of 4-diamond strings of geometrics on each leg. 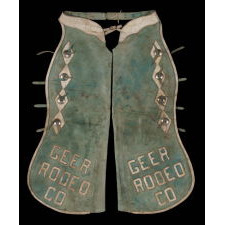 These, along with lettering that advertises the rodeo, were cut from white painted leather and appliquéd on the blue-green ground. 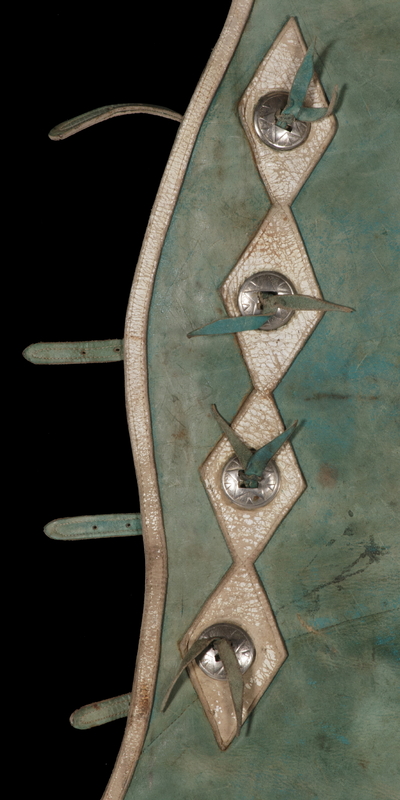 The scalloped waistband is also white and there is a white belt with a nickel-plated buckle. 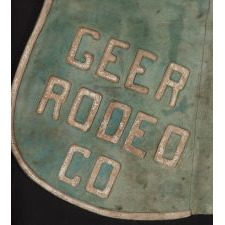 While the chaps have the look and feel of the 1930’s, Geer Rodeo was founded in 1960 and these would most likely date between that time and the 1970’s. 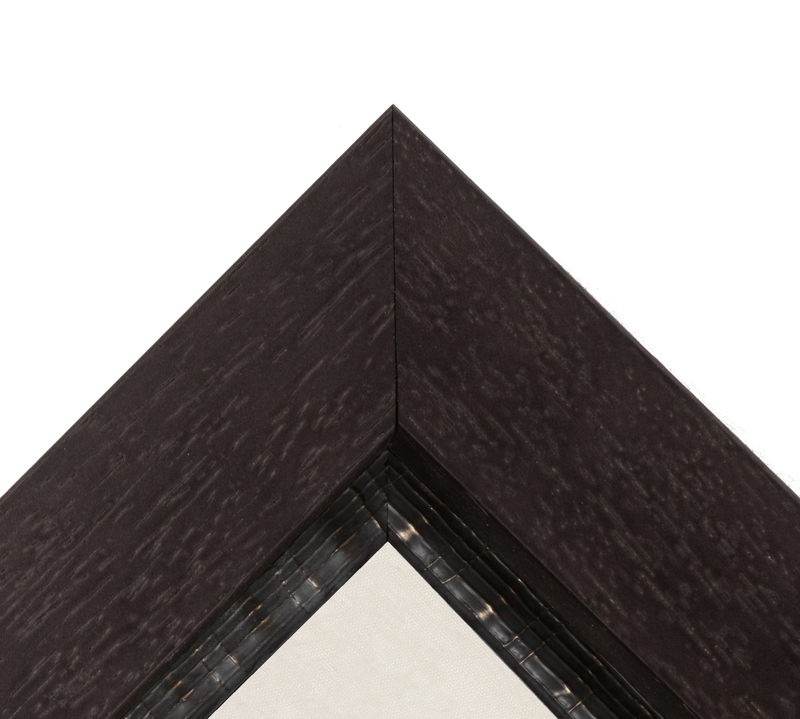 Despite the fairly late date, they display superb visual qualities. 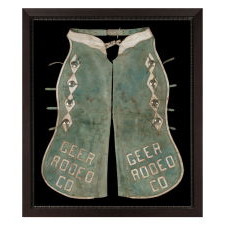 Miles (Bud) Geer was born in Minnesota in 1921. At age 14 he contracted meningitis. The treatment in those days was to pack the patient in ice. When they did this, his infected ear ruptured, permanently affecting his hearing as well as his equilibrium, and he lost his ability to walk. In spite of his physical challenges, and in a style Teddy Roosevelt would have encouraged and applauded, he learned to read lips and taught himself to walk again by pushing round a wooden chair, as well as through riding horses. He credited his familiarity with them as also having significantly contributed to regain mobility. He watched a certain point, for example, such as their ears, intently, which allowed him to move successively towards them without falling. In the 1930’s his family moved to Montana. He worked with and rode horses, and following high school, went to work on a ranch near the town of Nashua. In 1944 he married and in 1948 moved 12 miles north of Nashua to a farmstead that would become known as Geer Place. 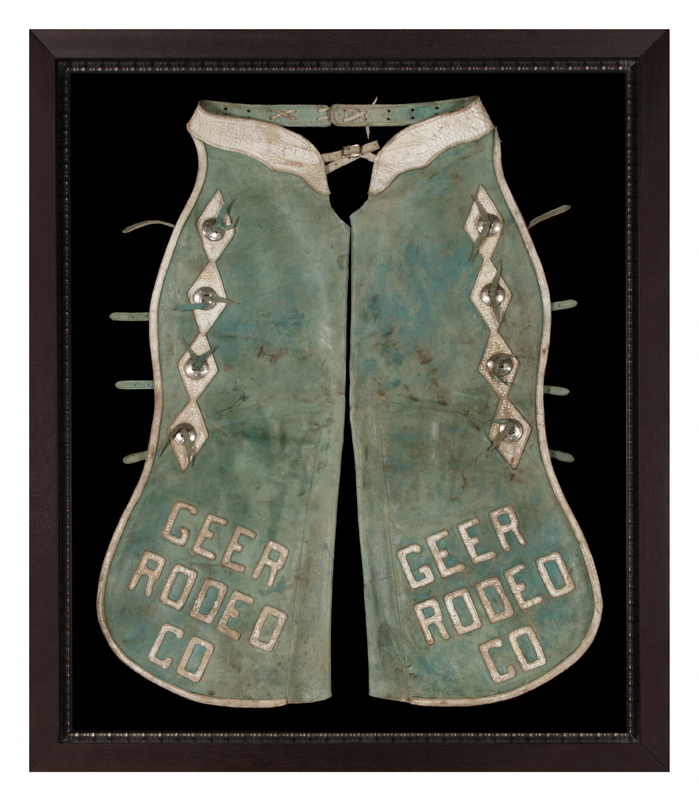 He acquired his own stock and in 1960 began moving them over to a rodeo company that, in the years that followed, supplied bucking broncos (his specialty), bulls, and other animals to rodeos throughout the region. 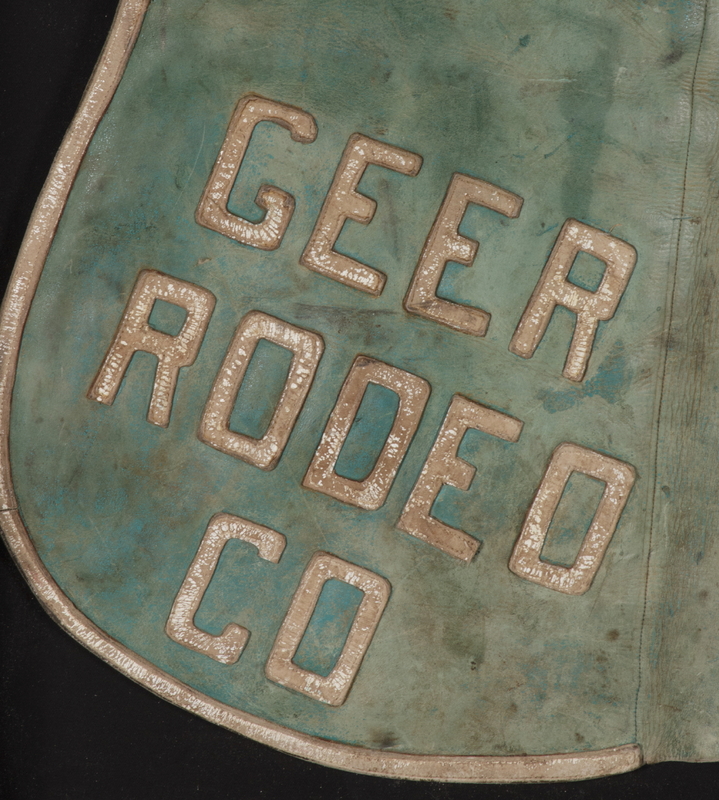 In 2015 Bud Geer was inducted into the Montana Cowboy Hall of Fame. 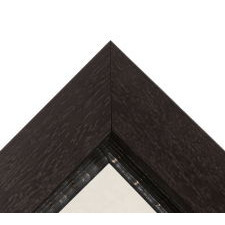 He passed in January of 2018 at the age of 96. Condition: There is expected wear, paint loss, and soiling, the patina and presentation of which are particularly charming.